Richly evocative instrumental Roots/Americana with beautifully crafted tunes featuring guitar, pedal steel, dobro, string bass and drums. 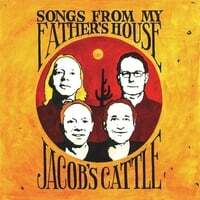 Jacob’s Cattle is the name of the current project led by guitarist/tunesmith Roy Patterson. The band’s hybrid instrumental form of Roots/Americana is highly evocative and reflects a level of artistry that is both sophisticated and emotionally compelling. To say that I was born into a musical family would not be an overstatement; everyone played an instrument to some degree. What would be more relevant though would be to say that I grew up in a musical house, with an old tube-powered radio fired up on a daily basis, extruding a regular stream of country music and a diverse hit parade of songs from Hank Williams and Buck Owens, Ray Charles, Harry Belafonte, Petula Clarke, The Ventures and the gamut of artists who defined the popular music of the era. The two or three TV stations on the old black & white set featured weekly musical shows that we sat down and watched as a family and I noticed early on that my father had great respect for musicians. My child's mind concluded, "Music...good." What strikes me in retrospect is the lack of distinction that I made between musical styles; it was all just music; enriching, full of fun and all good. The songs on this recording are based on imprints from the sounds I heard growing up in My Father's House in rural Nova Scotia and the music of my teenage years, albeit filtered through subsequent decades of life's antics. Although Jacob’s Cattle represents a new/old direction for the guitarist/band leader, it is definitely not his first time out. For roughly three decades Roy was part of the Canadian jazz scene and racked up an impressive list of credits. In 1996 his quartet won 1st prize at the Montreal International Jazz festival (the first Toronto based band to do so) the Jazz Report’s “Guitarist of the Year” award for 2000, performances in Europe, the U.S.A. and Asia. There were numerous Canadian tours in support of six CDs released under his own name and radio and TV appearances including a one hour special for Bravo. Ironically, at a time when he is moving away from the jazz world and returning to a roots-based style, Roy was recently profiled in the Hal Leonard book, “The Great Jazz Guitarists – The Ultimate Guide” authored by Scott Yanow. For those who might be worried that Jacob’s Cattle is “too jazzy” one need not be concerned. Roy’s earliest playing experiences at all-night blues jams in Nova Scotia as a teenager and the six nighters on the Queen St. country & western circuit when he first moved to Toronto serve to ground his playing, and with three east coasters and a seasoned pedal steel player the band’s roots run deep. It’s all about carefully crafted tunes, depth and communication.